The LCD screen provides all key feedback : speed, time, incline, distance, calories and heart rate. The console features 16 preset workouts which control the speed and incline of the treadmill to guide you through an effective session. A maximum speed of 16 km/h with 10% motorised incline. Getting fit shouldn't cost the earth and the ProForm 530 ZLT treadmill provides everything you need to improve your health and fitness at home in an affordable package. A maximum speed of 16 km/h with 10% motorised incline offers power to test even the fittest user, while motivation is provided with the iFit SD card reader and integrated audio system. The folding mechanism of this equipment coupled with it's transportation wheels make it an easy treadmill to fold up and store when not in use, and the easy-down technology means you don't need to do nearly so much lifting during the unpacking process. 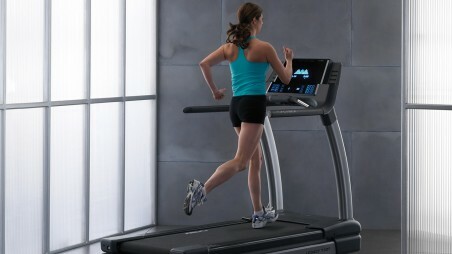 This treadmill has a constant power output of 2hp, but can output up to 3hp to maintain performance over short periods. TreadSoft cushioning reduces impact on your joints by up to 15% compared to road running and the handlebars feature Dual-Grip EKG™ Heart Rate Monitors. This treadmill is an ex demo model. Lifetime on frame and chassis. 5 years motor. 2 years on parts and labour. *Product Warranty is Standard 12 months and upgraded to 2 years, unless otherwise stated. Upon registering the product warranty within 28 days of purchase, Warranty Card must be received by Proform customer services. Compatible Music Port for iPod®**, Intermix Acoustics™ 2.0. SpaceSaver® Design, EasyLift Shock.